Watching As the Gods Will is like observing a group of people try to solve the world's deadliest escape room. You don't really know them, and you don't really care what happens to them, but damned if you don't want to see them solve the next puzzle. And when the puzzles are this wacky and fun, it'll be a good time whether they win or lose. Slacker high school student Shun (Sôta Fukushi), who tells us via voiceover that he believes life is boring and pointless, is having an unusually violent day at school. A sentient Daruma doll (a traditional Japanese doll seen as a talisman of good luck) is forcing his class to play a lethal game of "Red Light/Green Light." If you move out of turn, you're dead, decapitated in a shower of red beads and blood. A series of increasingly insane trials and puzzles await Shun, his childhood friend Ichika (Hirona Yamazaki) and the school psycho Takeru (Ryunosuke Kamiki): a lucky neko cat hungry for humans, murderous kokeshi dolls and all sorts of relics of the past out to get them, one by one. Some of the fun of the film is the "who's who" of cultural and mythological references, making the students literally the playthings of the gods, nightmarish entities that are all creatively, cleverly designed, and look spectacularly creepy despite some cheesy CGI. Their respective scenes are inventive, and the solutions to their defeats are satisfyingly clever. In typical death-game survival fashion, these are not fleshed-out characters. They're relatively interchangeable and one-note — the reluctant hero, the girl next door, the crazy guy, the cannon fodder and so on. 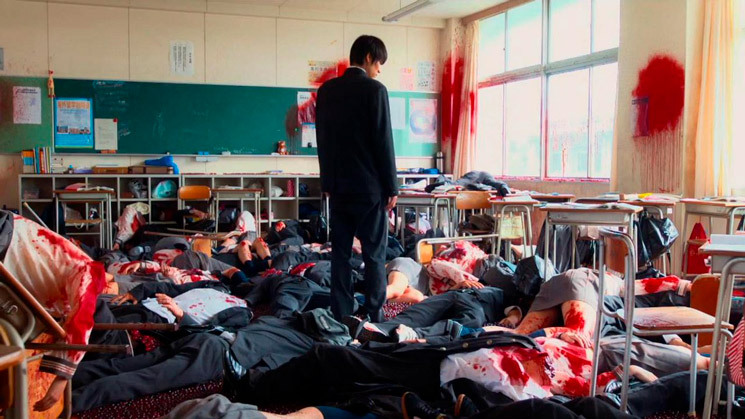 Occasionally, director Takashi Miike throws in some allusions to wider themes that hint at society's obsession with reality TV, violent video games and sensationalized news coverage, but it's all perfunctory. As the Gods Will ends on a weirdly abrupt note that sets up a possible sequel, and some of its bizarre plot points are left hanging and unexplained, but it's the fun of it that matters. Miike knows this, which is why the film smartly spends far more time delighting in the absurdity of murderous wooden polar bears and deadly sing-alongs.